Seneca Hill Chess Club is running a series of fundraising activities to sponsor Natalia Khoudgarian WIM, Jackie Peng WCM and Yelizaveta Orlova WCM to 40th World Chess Olympiad in Istanbul, Turkey; and Aman Hambleton FM to World Junior Chess Championship in Athens, Greece. A simultaneous exhibition is a chess game exhibition in which one player plays multiple games at a time with a number of other players. All proceeds, including those from Oriole weekly Sunday tournaments go to the sponsorship. Congrats to Benjamin and Jonathan! In the CCC which was held in Halifix on May 20 and 21, Benjamin came first in Grade 2 and Jonathan came 3rd in Grade 1. We are so proud of you! One of the activities is the Siblings and Friends Tournament at the OGCC 2012. Open to all Kindergarten to G.12 students. Entry fee: $12 per player pay on site. Refreshment: Snacks and drinks are provided. Registration: 10:30 – 11:30, limited to 30 players. Pre-registration by email recommended, email full name and grade to ogcc2003@rogers.com or use web form here. The finals were held on May 4 at Lawrence Park. 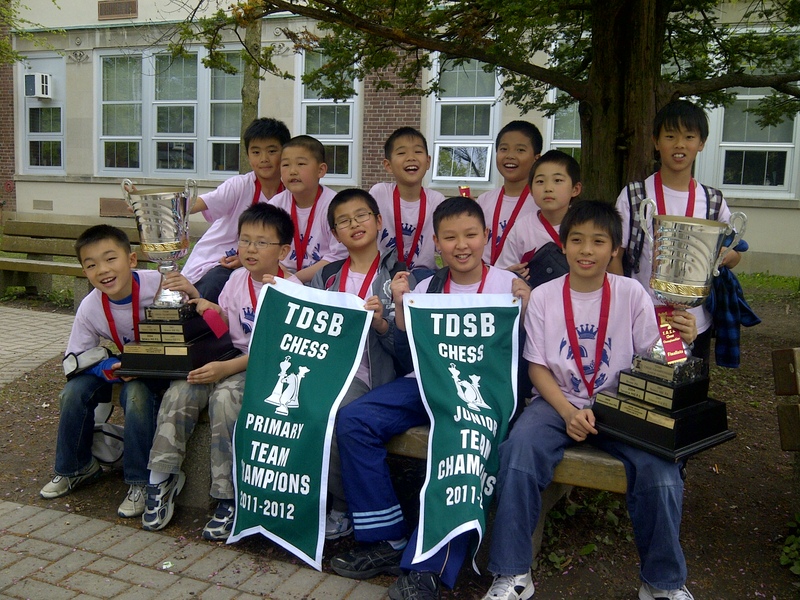 Both of our teams: Junior and Primary came first in the TDSB finals. We brought back to school the two big trophies and two pennants. Each player received a medals. Seneca Hill, congratulations for another successful and amazing year!